A pub run by the same family for more than 170 years has suffered "significant" damage following a blaze, firefighters have said. 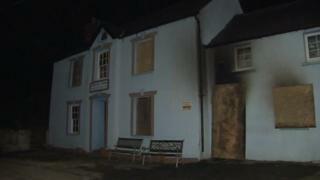 Two crews were called to the Dyffryn Arms, in Pontfaen, Pembrokeshire, at 12:05 GMT on Sunday. The popular watering-hole, known locally as Bessie's after landlady Bessie Davies, has been open since 1840 and features in several tourist guides. The fire service said a dog died in the blaze, but no-one else was hurt. The pub has been praised in several tourist guides for its charm and unique character. Visit Pembrokeshire's tourist page describes the establishment as "A pub on the outside, but inside, the home of Bessie - the wonderful landlady." Its website said: "She has been serving the best bass beer in Pembrokeshire since she was 20, 66 years ago now, from a hatch in her front room. Famous with visitors and locals alike, the pub has been in her family since 1840." News of the fire has been met with shock by locals and its patrons on social media.